I have nothing to post really. When I'm occupied lately--cooking dinner, for example, or working on a project--Gabe occupies himself by emptying drawers and cupboards, occasionally playing with 'toys.' After a while, he likes to get my attention by shoving himself at my legs. Once he's in my arms, he kisses me several times and grins at me. Lucy loved her daddy's idea of taking a walk tonight in the big stroller. They put two sleeping bags in the stroller then Lucy and Gabe cocooned for the walk in the cold and dark. Unfortunately, Gabe hated it. They came home shortly (hate to say it, but I had a feeling they wouldn't get far), then went for a ride in the car. Lucy wanted to sleep in the sleeping bag, so we just set it on her bed. The thought of her snuggled up in that bag right now just makes ME grin. Mr. Esquith at work. You should read his book. I've been reading a book I got a while back called, "Teach Like Your Hair's On Fire" by Rafe Esquith. (Highly recommended.) Like most books I read, this one has gotten under my skin and it has been leaking into my life. Full disclosure, though: I'm quite taken with this guy, Rafe. For one thing, one of his mantras seems to be: "There are no shortcuts." This, in all seriousness, is maybe my first ever BIG REALIZATION in life. I think I realized this for myself in about 8th grade. I don't know if I've ever heard anyone else ever even say this. Anyway, as I was sorting laundry this morning with Lucy, I decided to try to work in a lesson about the levels of moral development and motivation. "So Lucy," I say--casually. "What do you think is better: Being nice so you won't get in trouble, or being nice because you want to be a nice person?" "Yeah. It's good to be nice. So we won't get in trouble..."
I tried again, a few different times on this tack then switched. I thought I would get her thinking about admirable character traits and we could discuss them a little. "Hey, who are some of your favorite grown-ups?" This question to be followed-up with, "Why?" With no hesitation whatsoever, Lucy answers, "You and Daddy." A couple more attempts at asking the same question yielded the same answer. I couldn't ask her why. Gabe is a machine. He eats. I am a machine. I feed him and change his diaper. He has come to protest any efforts to get him to sleep. The one place he will sleep without a fight (and I do mean a fight), is his carseat. Today, I stopped fighting. I put him in his carseat (car in the garage) and let him have his nap while I worked on the laundry. When he woke up, I loaded Lucy into the car and set out on our library outing. (Thank you, Mary Poppins.) Tonight, instead of trying to bear Gabe's protestations, I took him straight to the carseat. He was sleeping withing a minute without complaint. I read my book in the front seat until he was deep enough to transfer him. Win! I feel like a genius. I have truly been at the end of my rope trying to get him to sleep lately. Nothing has worked. He's been sick and teething (four molars at once), so I can't blame him. 1) Mix Tapes must be submitted to me in the form of a CD (I know... seems wrong to call it a tape) via hand delivery or mail. 2) MToL entries must have a minimum of 10 songs and a maximum of 20 songs. 3) The first half of the MToL must contain super cheesy, cliche love songs that you are embarassed to admit you love. The second half of the MToL must contain really amazing, rad love songs- the kind that you listen to on repeat for hours on end. 4) Entries must include a playlist including song names and artists. 5) Entries must be received by December 1st. That gives you one month, people. 6) Points will be given to cheesy love songs that make me laugh. Points will be given to amazing love songs that make me hit repeat. Points will also be granted based on originality and creativity. 7) The Winner will be declared... as soon as I listen to all the CDs (depending on how many entries there are... you know, like if all 1 of you who still read this blog want to enter). 8) All playlists will be posted here when the winner is announced. 9) The Winner will receive, um, something really cool. Like an iTunes gift card. All entries will receive some sort of prize (though it probably won't be as cool as a gift card). Good idea, right? I love the whole spirit of her. That was going to be the start of a new sentence but I decided it could stand on it's own. I love Christy's spirit and the spirit of her contest. To me it was an offering to LOVE. And let's face it. I am a fan, a major supporter. Want a CD? As a faithful reader of this blog, I am offering you one. Just e-mail me at valerie.tayler@gmail.com with your address and I will send you your very own copy of this winning mix. I will send internationally. And now for my retrospective musings: I totally forgot to send a playlist to Christy with my entry. I am lucky that she is a forgiving soul. 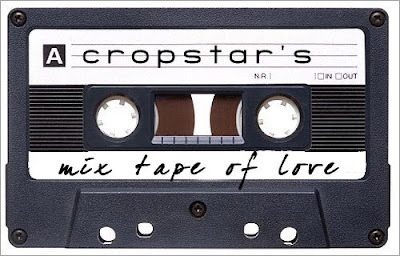 AND, if I were any kind of competitor, I would have posted this when Christy was actually having her contest so you could have made her a mix tape of love. Oh well.